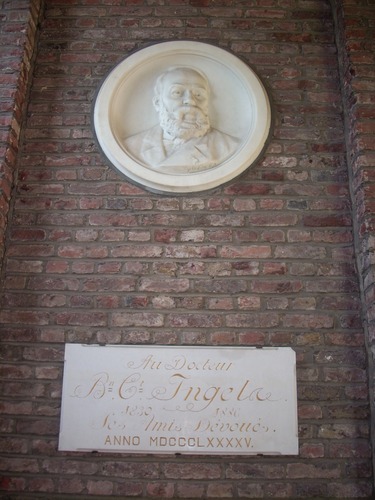 This bas-relief medallion and memorial tablet of Benjamin Ingels can be found on the former house of the physician1, near the entrance to the Museum Dr. Guislain in Ghent. The French inscription reads as follows: "Au Docteur / Bn. Ct. Ingels / 1830 1886 / Les Amis Dévoués / ANNO MDCCCLXXXXV". Photos by Luca Borghi[ti.supmacinu|ihgrob.l#ti.supmacinu|ihgrob.l ] (August 2009), courtesy of Museum Dr. Guislain. 1. R.Stockman (ed. ), Neither Rhyme nor Reason. History of Psychiatry, Dr Guislain Museum, Ghent 1996, p. 121.